LEE'S SUMMIT, Mo. - The middle of summer is a busy time for Drew Coates. He's part of the duo that makes up Two Guys and a Hive . The end of July is harvest time for the beekeepers at the Lee's Summit-based honey company. What Coates does with his finished product sets him apart from other beekeepers. 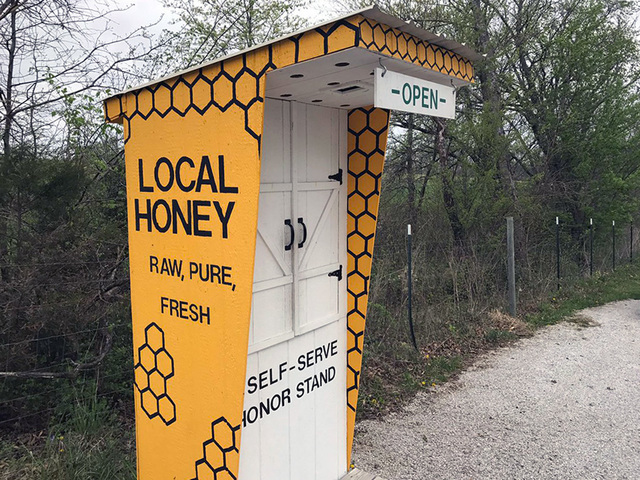 He leaves all his honey, beeswax candles and soaps in a stand alongside the road and asks customers be honest and pay for what they take by leaving money in a box inside the stand. The honor stand he established along Hamblen Road about three years ago has been so successful, he's opening a second stand this summer. "I get thank you letters, sometimes I get tips. By and far, the majority of customers, 99 percent of them, are as honest as the day is long," Coates said. He chose to sell this way because Missouri law basically says people who make their products out of their homes, like Coates, have to sell directly to consumers, not to distributors. Coates didn’t want to spend every weekend at a farmers' market, so he set up a place where customers can come to his products. "I've tried to get other beekeepers to try this. They are all a little reluctant. I can fully understand it because it does hurt when you get hit, and you will get hit now and again," he admitted. Kind of like a beekeeper will get stung, someone selling out of an honor stand will get hit. It's an occupational hazard. Coates said he has upgraded the security on his money box over the years to keep thieves from taking it and what's inside. The first stand is on Hamblen Road, north of Gann Lane in Greenwood. Coates said he will open his second stand on Southwest Jefferson Street near Stuart Road in Lee’s Summit.